with over 26 years experience of diving all over the world. "I would like to introduce myself. 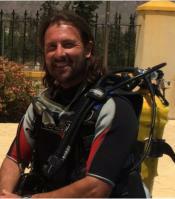 My name is MARK GRIFFIN, and I am qualified diving instructor with the BSAC. I also have further Advance Certificates in Diving. I started my dive school in Spain in 2007 and I have trained English, Spanish and Dutch to be qualified divers to the BSAC standard. I provide packages for each Course that I teach, and for any client that wants to dive in both Spain and England, at a reasonable cost, with all equipment provided, and accommodation arranged. I have dived all over the world - the Great Barrier Reef, Thailand, Egypt and not forgetting where it all started, the UK. It's the greatest pleasure to see someone get the thrill that I always experience with diving. While most clients are a bit apprehensive to at the start, they tell me it's the best experience they have ever had and they are glad they have done the course. Many of my clients keep in touch on a regular basis and I really appreciate finding out how they are and where in the world they have been diving in the world. So I say to people don't hold back - once you have had the experience of the underwater world you will want to continue exploring. To find out if you would like to take a Course with me, start with a try dive in a swimming pool with me and let your adventure begin".